Ok, so as the bride, you're probably not thinking much about bridal shower invitations. That's most likely your bestie or your mom's gangle of friends. 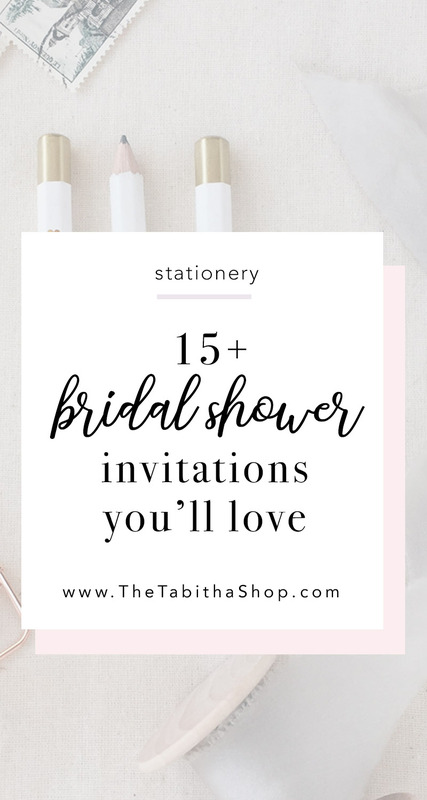 Nonetheless, if you have a say in the decor of the bridal shower - or maybe just want to nudge them in the right direction - I put together a list of 15+ bridal shower invite ideas that I think you'll LOVE. Some are soft and floral; others a bit more daring in their pigment. Either way, I think you'll find one you one you adore within your budget below. Printable floral invites FOREVER. I love the softness of the florals and the playfulness of the font. Because it's a printable, it's also super affordable, too! Oh, I love how classy this printable invite is! The florals combined with the bold font is perfection. Oh, this is beautiful for a fall shower! I love those moody florals and maroon font. Plus, it's also a printable, so you'll save lots of money! Greenery has been so on trend lately and I love it. It's classy and neutral. Plus, paired with that gorgeous font, it makes for a stunning invite combintation! Going for a rustic elegant look? These minimal beauties look gorgeous on kraft paper. This one would also be gorgeous printed on kraft paper! Or, if you don't want to go too rustic, this is perfect for a minimal, classy bridal shower in the city. I'm sure you've noticed by now that I'm a serious sucker for drooping florals. And that gorgeous font! Oh, I am just in love with this invite. It's not a printable, like the ones above, but you'll definitely get what you paid for! How about this darling, whimsical twist on a shower invitation? This boho invite is begging for a party featuring a mimosa bar and, obviously, white balloons with floral tails. If you're not loving all of these soft floral designs, this pretty little number might be more of your style. The dark blue with the gold accents are perfect to shake things up. This invite is so freaking dainty and I am so in love with it. You can change the shades of florals to any color you so choose and the shape is also customizable, too! Ohhh, this is beautiful enough to frame after the shower! I love those pretty flowers and the "bride" tucked right at home in the middle of them. Nearly anything watercolor has a tiny little home in my heart. I love the loose brush strokes and gorgeous color combination in this invitation! I've shown you florals on top, bottom, but none in the middle yet. I love that you can see the whole bouquet in this invite! Here's a darker, but still just as beautiful, alternative to the floral bouquet! If the bride to be favors white florals with lots of greenery, this is a gorgeous invite just for her!